Koalas are extremely cute in nature – and they also happen to be one of the endearing mascots whenever you pay a visit Down Under (that is, Australia). Well, if that is the case, you might as well kill two birds with a single proverbial stone thanks to the $39.99 Hi-Koala Huggable Portable Speaker. 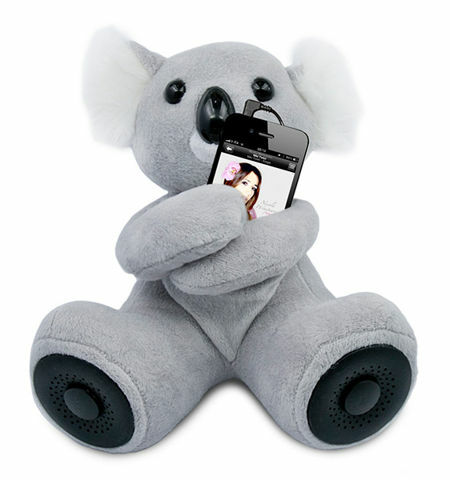 The name of this particular portable speaker gives the game away – you get what looks like a stuffed animal at first, but in reality, it is a portable speaker since the koala itself will continue to hug your device as music is played back over it. Apart from that, the Hi-Koala Huggable Portable Speaker will also be compatible with any other audio playback device or smartphone that has a 3.5mm headphone jack. This does seem to be the ideal purchase for kids if you do a whole lot of traveling, since they will have a new stuffed toy to hug, not to mention having their own portable speaker to soothe those wrangled nerves with their favorite tunes. A single set of batteries will be able to last for up to 10 hours of non-stop playback, but do keep a pair of AA batteries as a spare just in case.